Republic of Srpska: Provocation gone wrong: Murky forces instigating Odessa violence? 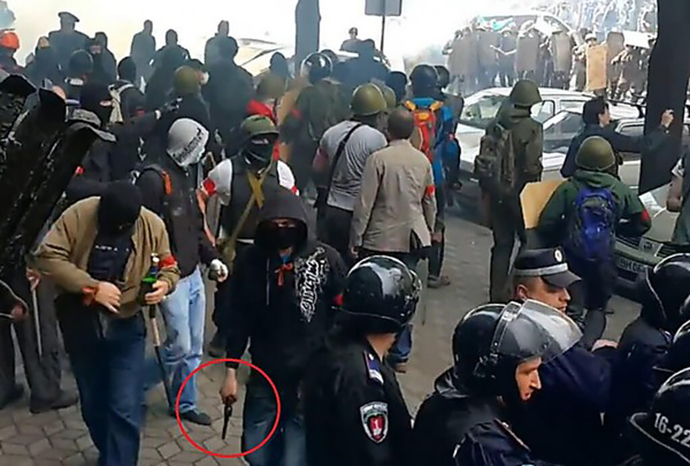 Video footage filmed during the bloody events in Odessa that claimed dozens of lives on Friday shows a more complicated picture, with provocateurs instigating the violence. Ukrainian authorities blamed the pro-autonomy activists for starting the clashes that led to the tragic fire at the House of Trade Unions. The interior ministry stated that anti-Kiev activists attacked supporters of Kiev authorities before retreating to the building for shelter, and threw petrol bombs at the crowd triggering the fire. Russia’s Channel One television reconstructed the chronological order of events using publicly available YouTube videos detailing what happened in Odessa on Friday. It began with a football match between two teams – Chernomorets Odessa and Metalist Kharkov. Despite the high political tensions in the region, authorities still allowed the match to take place, realizing that a few thousand pro-Kiev football fans would be arriving to the city. Following the match, around 1,500 supporters of the Kiev authorities and football ultras came together for a march in support of Ukraine’s unity. The rally was sanctioned by local authorities. Nationalists made their way towards the center of the city chanting “Glory to Ukraine” and “Death to enemies,” as well as “Knife the Moskals (derogatory for Russians).” Some people in the group wore ultra-nationalist movement insignia. Then the visibly smaller group of alleged anti-Kiev activists started to attack the march, apparently provoking the demonstrators. Footage then shows a smaller group men wearing red bands luring the pro-Kiev crowd into a different direction. At some point, the police line opened up to let the men wearing red bands through and closed back up again. A video then shows a man standing behind the police lines shooting at the pro-Kiev crowd. The provocations succeeded in triggering clashes, as both sides began to throw stones, and shots were heard. The alleged anti-Kiev activists then disappeared and angry pro-Kiev supporters headed to the opposition camp based in front of the House of Trade Unions. However, none of the original attackers with the red bands were there. Instead, a few dozen pro-autonomy activists were surrounding the camp. When the activists saw the angry mob approaching, they took shelter inside the House of Trade Unions. But the Ukrainian Interior Ministry offers a different version of events, saying the victims of the violent unrest started the fire themselves when they began throwing Molotov cocktails from the upper floor. Multiple videos of the incident, however, show Molotov cocktails flying from outside the building. Another video shows that some radical pro-Kiev elements were also inside the building, waving a Ukrainian flag.